Vamana Trivikrama Avathara Sthalam. It was here that Mudal Azhwars (poigai, Bhoodath and peiyazhwar's) met one night in a small room. They felt the presence of one more person and found the Lord and Piratti(Lakshmi) and composed the First three Tiruvanddadi in praise of Him. This is one of the five Krisharanya Kshetras. Mahabali's pride bit the dust in this kshetra. Direction and Posture Standing and East-faced. The unique feature of the temple is the Shanku is located on the right hand of the diety unlike the other temples. A Durga Devi sannidhi('Karpudaya Kanni') is also located within the shrine(Temple). Accessible from Cuddalore(about 45 miles) or from Thirukkoviloor station(Villupuram - Katpadi Line). It is 2 miles south of Pennai river. The Moolavar of this sthalam is Trivikraman. 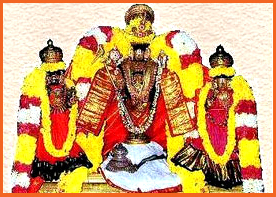 The Perumal is also called as "Dahaleesan". Moolavar in Nindra, Nadantha (Ulagalantha) kolam facing East direction and his right leg lifted upwards towards the sky. And the great and a special thing is that the Sangu, which will be usually on the left hand is on the right hand and the Chakkaram which will be on the right hand is on the left hand. This temple is situated in South Arcot district in Tamil Nadu. 2 kms away from Thirukoviloor, which is in between Vizhupuram to Kaatpaadi railway lane. Some other routes are from Pondicherry to Bangalore, Chitoor - Trichy (Via vellore) - Cuddalore, from Tiruvannamalai, Vizhupuram also have plenty of bus facilities. It is situated on the sea shore of Thenpanni river.